WVIA-FM Program Manager and afternoon classical music host, Larry Vojtko began his tenure at the station in 1982 as the early morning host/announcer. He is also the prouducer and host of most of the concert broadcasts for the station. During his tenure Larry has interviewed many celebrities and musicians of international renown such as clarinetist Richard Stoltzman, pianists Leon Fleisher and Jean-Yves Thibaudet, baroque cellist Anner Bylsma, conductor/composer Gunther Schuller, and bass Paul Plishka. 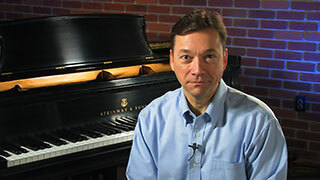 He also organizes and produces the WVIA "Simply Grand" series of in-studio classical concerts. In May 2003, Larry led the Northeastern Pennsylvania Philharmonic in concert as guest conductor, an honor bestowed in observance of Larry’s 20th anniversary with WVIA. In addition to his work at WVIA, Larry has remained actively involved in the music community of Northeastern Pennsylvania. The baritone has sung with many area ensembles including: the Robert Dale Chorale, Mostly Opera, Zusammen, Amici Cantus, the Wyoming Valley Oratorio Society, St. Cecilia's Church Choir and the Choir of the First Presbyterian Church in Wilkes-Barre where he was baritone soloist for nine years. He has cultivated a keen interest in musical theater by working both as a performer and Music Director in many productions of community theatres including: Little Theatre of Wilkes-Barre, Showcase Theater and Music Box Dinner Playhouse. Larry received a B.S. degree in Music Education from Wilkes College. After graduation he continued his musical studies in voice with Mr. Richard Chapline and is currently a student of Metropolitan Opera baritone Theodore Lambrinos. Larry continues to teach voice privately. He is also an adjunct faculty member of the Communications Department of Luzerne County Community College. Larry lives in Wyoming with his wife, Bernardine, and sons, Michael Lawrence and Jonathan Matthew. You can listen to Larry every weekday afternoon from 1-4 PM.